Multipolarity or Unipolarity for Eurasia’s Future? Answer: I don’t know. Let’s dig deeper! Here is a good article from The New Statesman. I have a few additional points I would like to add to it. Moscow is only going to take expanding Chinese influence in the region for so long without some sort of give and take, especially as they have potentially more to offer. Its hard to see the ultranationalist and increasingly xenophobic Russian state asserting itself towards the west and giving up in the east. Of course, that might also be the idea. Secretly Moscow might see such a bend as inevitable and thus the immense pride and low risk force projection towards geriatric Europe and world-hated ISIS is the cover for a massive but calculated preparation to take junior status to China in all but name on the world stage. Either way, the United States and its allies are doing everything they possibly can to shoot themselves in the foot right now as a big part of what draws these powers together is the scheming of Atlantic nations who have little strategic gain in the region but at least superficially and sometimes directly support opposition movements anyway. It is fascinating to watch American grand strategy drive two natural rivals closer together based on nothing but overconfidence and overreach. We don’t just have a military-industrial complex, we have a liberal-humanitarian NGO complex too. Both influence strategic decision making in often unwise directions. I would be willing to bet that the Sino-Russian relationship would have already started breaking down by now if not for the complacent imperial overreach and narcissistic Wilsonianism of the US and its allies. And if they keep pushing they risk making this otherwise temporary arrangement of convenience a permanent one, locking them out of the region entirely for sure. But no matter what happens in this arrangement Russia might still be the loser. 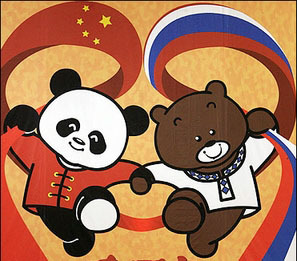 A rivalry with the US is much less dangerous than a rivalry with China for them, whereas a rivalry with Russia is significantly less dangerous for China. Expanding influence into Central Asia seems a much less risky move than the South Pacific on the part of Beijing. Any such action could be more exploited by the US to divide the powers. Of course, if these countries do hold onto a Eurasian lock together against the odds long term they really would have made the first large scale and successful multi-regional check on US ambitions…well, possibly ever. It is a fascinating time for grand strategy, that is for sure. There is nothing else (contemporary, anyway) I would rather study.